I’ve spent the day getting ready for our Carolina Cook Out for the Foodbuzz 24, 24, 24. Foodbuzz is one of the largest foodie communities online, and they select chefs to highlight each month. It’s 24 food bloggers with 24 meals across the globe over 24 hours. Then, everyone blogs and shares the experiences. My idea is to share our local North Carolina flavor which includes the food, the people, and the companies in the area. We’re Southern, so a cook out is way more than just the food, although we do love some good eatin’ around these parts. 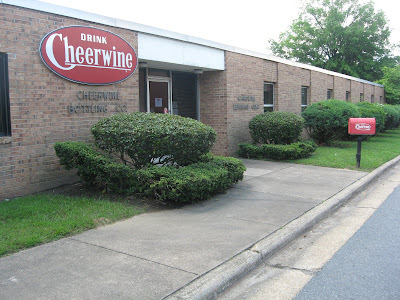 My first stop was the Cheerwine bottling company. That’s our local soft drink. Like Ginger Ale which is not an alcoholic beverage, Cheerwine is a soda and not wine. The color is just similar to red wine, so that’s how the name came about – just like ginger ale looks kind of like ale when poured in a glass. I got the Cheerwine in the old fashioned bottles. Those are the very best. The cans are great too. The flavor is . . . hum . . . I hate to say cherry cola. It’s not really that, but it’s as close as I can come to explaining this very unique Southern soft drink. We’ll also have Pepsi products. If you didn’t know, North Carolina is also the birthplace of Pepsi. Since this is a cook out, we’ll be grilling. Holland and Big Drum Smoker both make NC grills and both excellent products. I just don’t happen to have those, so I’ll be rolling out to the Bull Hole or RiverPark in Cooleemee, NC with a couple of Weber kettles, a City Grill, a CADAC, and the Cobb. The City Grill, CADAC, and Cobb are all excellent tailgaters. The kettles are 22 inches, so those will be going in a pick up truck. With my local theme, grill supplies turned out to be really easy. Lowe’s Home Improvement started up in 1946 in Wilksboro, NC. They have headquarter offices around here, and some of my students go work for Lowe’s after college graduation. Some of my neighbors work for Lowe’s and also my Aunt Betty. They have all I need for grilling over at Lowe’s. I got my charcoal and gas bottles there. They are also super helpful there at Lowe’s. I don’t usually like the big super stores, but I’m fine at Lowe’s, since they do act like you’re a real person and take the time to help out. Joelburgers - Southern pimento cheese and sour dough bread - yum! Our burgers will be grilled by my friend Joel who makes the Joel Burger. 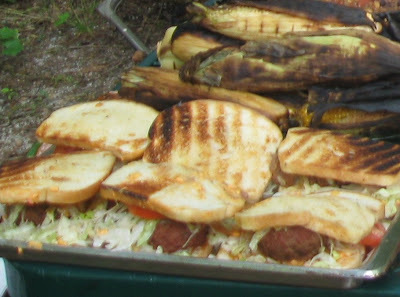 That’s a burger with pimento cheese on sourdough bread – both very popular North Carolina products. You can check out Joel Burgers at Finecastles in Greensboro (215 South Elm Street) if you don’t know Joel and don’t know how to make a unique Carolina burger. Phil Crawford from Fresh Cuts Butcher and Seafood out of Asheboro is bringing some pork loin. He does things the old fashioned way rather than buying meat in those containers that are frozen and shipped in. He gets fresh meat, and he cuts it himself. That's going to be some good eatin' as we say in the South. We’ll also have chicken from Tyson, a NC poultry company. Some of our guests eat gluten free, and Tyson is gluten free chicken. 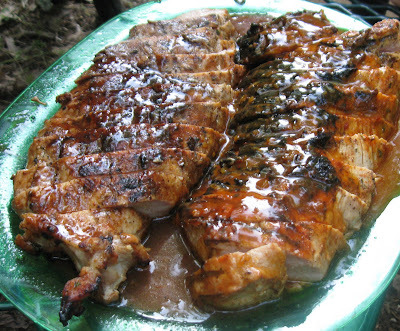 We’ll just grill some of that and then do some with John Boy & Billy’s Grillin’ Sauce. Those guys are syndicated radio hosts, and they love grilling so put out their own line of sauce here in the tarheel state. The hot dogs are BallPark which I like on the grill, since they do “plump up.” We do have some pink hot dogs local to North Carolina, but I couldn’t manage to find those. Maybe on the next cook out. Our other local NC meat won’t be grilled but will be featured in the baked beans. That’s Frank Corriher sausage. That’s the best sausage ever – other than what my Poppaw made at home with lots of sage and quite a kick on the heat. To add even a little more kick, I poured in a little Catdaddy Moonshine. On the sweet end with the beans, there’s local North Carolina honey. Bryan Vaughan with the Bagel Shop in Asheboro is bringing - of course - some bagels. These are real bagels, and there's a world of difference. The inside of Bryan's bagels are like clouds. The texture is perfect and very different from the mass produced bagels at the grocery store. Our other bread (the hot dog buns) are Bunny Bread. Those come out of South Carolina - our sister state. I remember when a student from up North was calling all our bread Bunny Bread. She thought we called our white bread Bunny Bread. I explained to her that there's really a bread called Bunny Bread. A friend is making the potato salad, and since this is the South, I’d bet the mayonnaise is Hellman’s. It’s got just a little kick of vinegar or something, so it’s tangier than most mayonnaises. The other big North Carolina barbecue sauces are Carolina Treet which was a barbecue joint sauce for chicken initially and is a thinner style sauce as are most North Carolina BBQ sauces and Bone Suckin’ Sauce (more of a traditional thick barbecue sauce). This is a farming community, so naturally the produce comes right from the farm, although some items are brought in from further South. It’s not quite time for some of our crops, although the strawberries are prime currently as well as the summer squash. 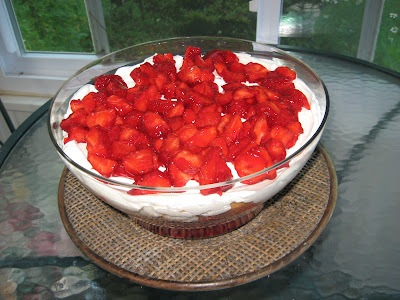 I got strawberries from Patterson’s Farm to make Strawberry Punch Bowl Cake. You can stop and buy some or even pick your own. Even Wal-Mart is now selling Patterson Farm strawberries, but it’s a lot less stressful to go to the farm than to big, loud, crowded Wal-Mart. One of the last things I did with my Dad before he died in a traffic accident two years ago was go to Patterson’s and pick baskets of strawberries. Mom and Harry (my new step dad) went down to Wetmore’s Farm for the cantaloupe. They’re neighbors in Woodleaf, NC. Super nice family. Some of the local teenagers work down there as well. So, that’s always a nice stop. Yes. It does take more time to go to the individual stores or farms and to look on the shelves at Food Lion (which is home based here in our county) for products from the area, but these are friends and neighbors. You know where your food came from and who made or grew it. Everything is fresher and less processed, since it doesn’t have to travel all over the country. I have 10 minutes to get the last of the food packed and get the trucks rolling down to the Bull Hole which straddles the Rowan and Davie County lines. The park is also called RiverPark in Cooleemee. It's a beautiful place. And, after rain all week, we have a glorious sunny day. Yippee! Great post, pictures and story! Hope you have a word with Eli's bud and inform him of better ways to communicate non-worrisome information. Anyway had a great time and glad that i got kids engaged into the cooking process so they begin a passion and skills for the future. FYI- Joelburger is commercially available at Fincastles in Greensboro not WS. Thanks again for inviting us. We had a ball! Hannah was really proud of helping make Joel Burgers. I'm taking their family a gas grill this week, so they can play around with it. The other kid was probably scared bad too. The one drowning pulled Eli under to start with. When Eli pushed him off, that kid sank. So, Eli had to dive under and try to find him in the muddy water. Then the current put them in low hanging trees until some guy helped pull the one who was passed out by that time on to the bank. I think it was Jimmy who realized Eli was in the water and went around the bend and yelled to my Mom that he had gone down river.